Triple the Number of Free Copies with Outskirts Press! 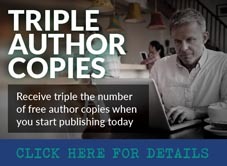 Authors have 2 days left to receive triple the number of free author copies when they get started with the Diamond or Pearl self-publishing packages. DON’T DELAY-THIS OFFER EXPIRES ON JULY 31ST! To receive the promotion, simply enter the promotion code TripleBooks when checking out of your shopping cart while purchasing the Diamond or Pearl publishing package. Click below for more information.